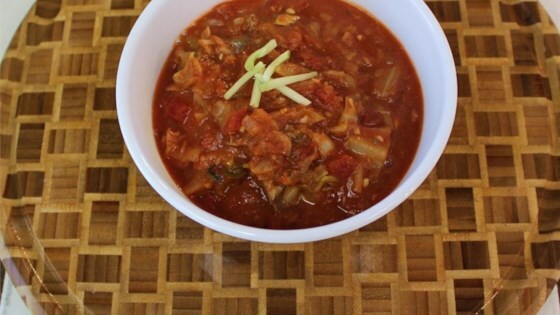 "A flavorful stew with tomatoes and cabbage. Very versatile. Serve with boiled yams, plantains, potatoes, rice, or any other starch on the side. Sardines in tomato sauce can stand in for the mackerel." Place cabbage into a large pot and cover with salted water; bring to a boil. Reduce heat to medium-low and simmer until just tender, about 10 minutes. Drain. Heat canola oil in a saucepan over medium heat. Cook and stir onion and garlic in hot oil until onion is translucent, 5 to 7 minutes. Stir tomatoes into onion mixture, place cover on saucepan, and cook until tomatoes are soft, 10 to 15 minutes. Mix water and tomato paste in a small bowl until smooth; pour into the saucepan. Stir the mixture, replace the cover, and cook another 5 minutes. Add mackerel in tomato sauce; season with red pepper flakes and seasoned salt. Stir drained cabbage into the mixture. Cover saucepan and simmer mixture until mackerel is hot, 10 to 15 minutes. Simple and quick to make. Very tasty and healthy too. When I have more time I plan to make it with all fresh ingredients. Thanks for a delicious meal. This recipe is very good to me but my brother hated it. I think if you love paella you will like this. I would love to try this with mixed seafood. Great! I subbed canned tuna for the mackerel and added some African hot sauce for some extra flavor. Thanks for sharing.